We are one of the fastest growing packaging unit based at Udumalpet, Near Tirupur, Tamil Nadu, INDIA. We are "ISO 9001:2008" certified woven sack unit by Insight Certifications Private Limited and accredited certificate issued by Accreditation Services for Certifying Bodies (Europe) Limited in accordance with ISO 17021:2006. We are engaged in all types of Woven Sacks, Fabrics as per client's requirement. We can supply all types of woven sacks in different weights, weaves, coated/ uncoated, with/ without liner, printed/ unprinted as per specified design. Our present manufacturing capacity is 9600MT/ Annum i.e. 3.00 Lakh PP Bags per day. 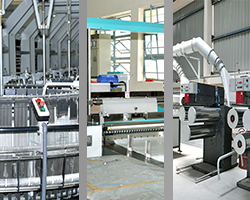 Group is equipped with all latest technology and machines. Our professionals share their successful experiences with our valued clients. Our products are not restricted to just your requirements but open to excel and exceed client dreams We develop products that are not just robust, but are secure and functionally correct.This conviction helped us reach zenith. Thomson Industries - PP Woven Sack Industry, like on this Group has achieved new heights every year. We are market leader.